I’m in Belize this week with fellow writer Rob Carry to get to know a country that’s high on the list of retirement havens for North Americans thanks to its easy residency, friendly banking laws, magnificent beaches, and unparalleled snorkeling and diving. But, today, we left the beaches behind to check out the other side of Belize—the Cayo District. (In Belize, a district is a geopolitical division, like a state or province.) Cayo is Belize’s heartland and is known for Mayan ruins, broad, lazy rivers, thick jungles, and large expanses of farmland. For the active, Cayo offers canoeing, zip lining, cave tubing, and horseback riding, not to mention the exploration of several hidden waterfalls and ancient Mayan temples. The Cayo district is home to a pair of small cities, San Ignacio and Santa Elena. You can find everything you need to stay supplied while living here. The area also has a number of small towns, such as Spanish Lookout, which offers most of what you need on a routine basis. The capital of Belize was relocated to the city of Belmopan in the Cayo District after Hurricane Hattie wiped out most of Belize City in 1961. We made the trip to check out two projects, which take particularly good advantage of the lifestyle this region has to offer. They’re intended for free and independent people who appreciate a simple, wholesome lifestyle and the great outdoors. Here’s my take on each of them. Maya Spring Estates is situated on 100 acres and is divided into only 20 lots. The terrain consists of partially wooded rolling hills bisected by a seasonal stream. People come here to enjoy the sights and sounds of nature and perhaps to enjoy the community park, so don’t look for an Olympic swimming pool, restaurants, dance lessons, or tennis courts. Instead it’s a local-style hardwood and thatch-roof pavilion that simply provides a gathering or picnic area for the neighborhood. A perfect spot to enjoy the view from a hammock or get friends together for a Sunday barbecue. The developer, however, does supply roads and electricity. The latter is a valuable piece of infrastructure because it’s an expensive endeavor in this part of the country to get it to your property. At this time, the development’s roads are installed, while the homeowners supply their own water and sewer systems. The homeowners at Maya Spring Estates are a mixture of those who want live off the grid, those who simply want to connect up to the power line, and those who prefer a hybrid situation where they have a solar-powered home supplemented by an electricity backup. Some homeowners bought here because they simply want some space around them. But others are making productive use of their properties by planting valuable crops like teak… still others intend to plant fruits and vegetables in order to have a self-sustaining property that will feed them, power them, and house them if necessary. Around half of the properties are sold, with a few homes already underway. The remaining lots vary from about 3 to 7 acres. Expert construction service can be easily arranged for about US$100 per square foot. This gets you high-quality, North American standards. You could build for less to local standards, although no one around here seems to be doing that. Lot prices start at US$73,000 and go up to US$147,000. For more information on Maya Spring Estates, contact developer Amma Carey. You can get in touch with her here. I think Maya Spring Estates is best for those who want to spread out and set themselves up with a resilient, self-sustaining lifestyle among rolling hills and long views. Carmelita Gardens was the next project we visited. It’s an off-grid community where each home is self-powered and with its own water supply (including its own subterranean reservoir). Carmelita Gardens is unique in that the tree-lined Belize River wraps itself around at least half the property, forming its southern and western borders. The project is designed as a small town, with neighborhoods, parks, a village square, community buildings, orchards, groves, and gardens. Lots at Carmelita Gardens start at US$28,000 and go up to US$62,000. On a limited number of selected lots, the developer is offering readers 25% off these prices. And the other big news is zero-interest lot financing. You can put US$1,000 down and pay US$500 per month until your lot is paid off. Carmelita Gardens also offers turn-key home construction, with homes starting at US$98,750. An interesting recent addition to the project plan is the River Club. 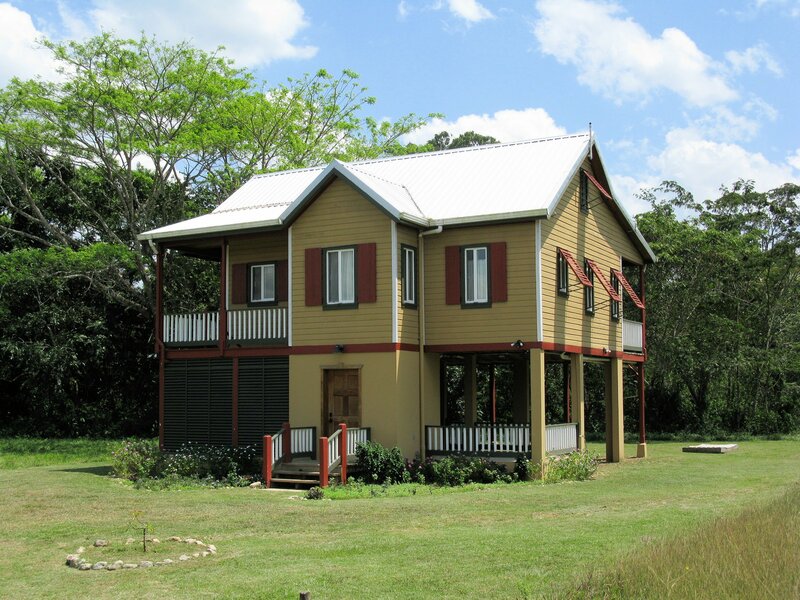 Located at the banks of the Belize River, these are smaller homes mostly intended to be rented out, targeting the bustling eco-tourism market in this area as well as neighbors who are building their homes and folks just wanting to get away for a while. 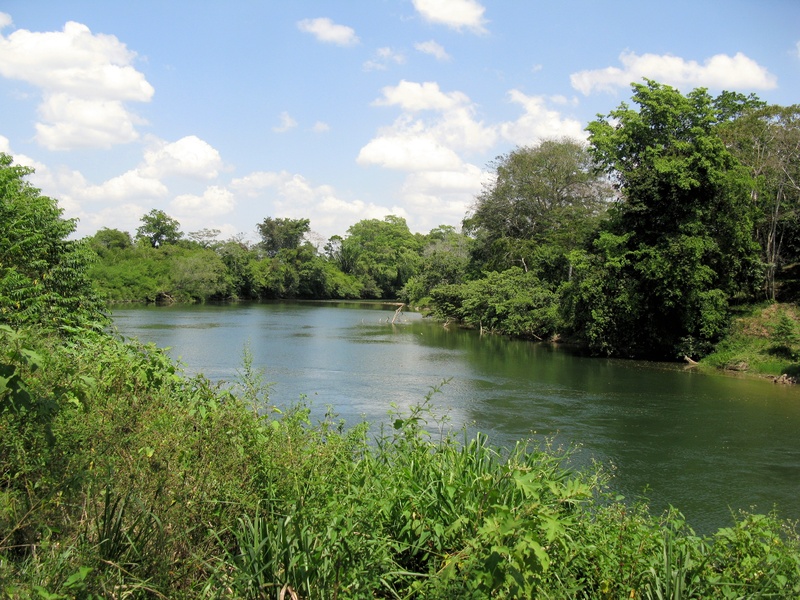 This part of the project will have access to a community pool and garden and also has river access, so you can easily launch your canoe to explore the Belize River… and wherever it leads. The 336- to 672-square-foot units come furnished in mahogany and are ready to go, starting at US$68,000. When you’re ready, Carmelita will supply rental management services. For more info, write to architect-developer Phil Hahn. Follow this link to contact Phil about Carmelita Gardens. 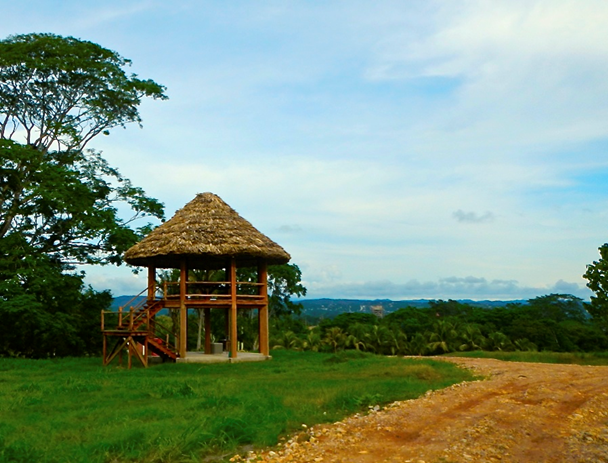 Carmelita Gardens is best for those looking for a community setting, which also offers off-grid living in a resilient community and easy access to the Belize River. The Cayo District is not for everyone. If you’re looking for fine dining, theater, and a broad wine selection at the grocery store, you won’t find them here. But the Cayo District is great for those who want peace, quiet, and a close interface with nature… who want to go back to a simpler, friendlier way of life that you can’t find today. And both of these projects do a good job at taking advantage of what Cayo has to offer. I am looking for three- to six-months rentals in Playa Coronado, Panama. I visited there and all I see are gringo prices. Do you have any suggestions on how to find Panamanian prices for that area? Coronado is the most popular expat location in Panama, so seeing gringo pricing in Coronado is like seeing it in Colorado Springs. You could also have a local person call on your behalf to try to get a better deal. These methods have limited success in foreign-dominated markets like Coronado, working better in markets that have a strong local component (like Panama City). You may want to try a local agent to see if they can come up with anything on your behalf. You can get in touch with Corrin Skubin here. I am a reader of several of your newsletters, and I have a question about owning a rental that I do not see addressed: whether the legal system in a given country is owner-friendly or tenant-friendly. For example, I know first-hand that in southern Spain (Andalusia), there are so many cases of bad tenants that a large number of houses on the Costa del Sol are left vacant rather than being rented out. If I buy a property, I want to rent it out. This means I need to be able to evict a tenant for nonpayment. So I would never buy a property on the Costa del Sol. I would like the Overseas Property Alert to mention specifically how the rental market is with respect to tenants’ rights. In most countries where I’ve owned properties, tenants’ rights are strong by U.S. standards. It can be very difficult to evict a tenant, and I’ve seen the process take up to two years in some places. However, this is for long-term rental contracts. Vacation and short-term rentals are different… including the Costa del Sol. With vacation rentals, the tenant pays in advance, including a damage deposit. If they’re staying for more than one month, subsequent months would also be paid up front. Vacationers generally have no desire to stay on permanently and would find it difficult to navigate the foreign court system. Remember that the laws that guarantee rights to renters are intended to protect someone from becoming homeless without due process. They’re not intended to protect a rich Englishman who wants to stay longer at the Costa del Sol or a wealthy American who wants to remain in Cancún. Whether you’re renting long- or short-term, make sure you’re using a good, solid contract reviewed by a local attorney.